SP Fort School of Nursing, Trivandrum, Kerala is a self-financing institute that is governed by the regulations and rules lay down by the Govt. of Kerala. The college comes under the name of SP Fort Educational Enterprises, which was established in the year 1998.The college also has SP Fort Hospital established with 250 beds for patients. The college was set up with the vision of searching for new horizons of knowledge and scientific ways to discover the need of humanity through research and education. The College also aims at providing the most suitable and desirable environment to discover the real needs of humanity and hence prepare the students for the placement all across the globe. The institute helps the students to prepare for the challenges that they are likely to face and hence moulds them according to the professional, competent nursing profession. Why to Join SP Fort School of Nursing, Trivandrum, Kerala? Facilities: The College can be considered as a well suited institution with all the basic amenities and services required to cater the need of the student. The college is fully air conditioned along with the audio visual aids that help make learning all the more fun. The college also offers its students library facility with all the relevant course and reference books for different subjects to learn from. 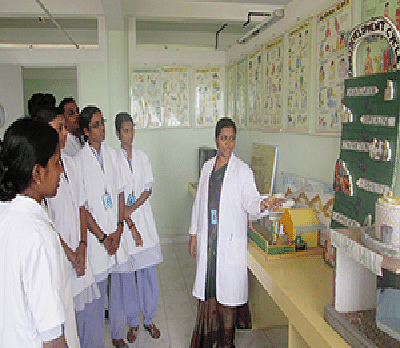 The college also tends to provide the students with well-developed labs to gain a practical exposure. Students are also given knowledge regarding computers. The college only has hostel facilities for girls with all basic needs and amenities. Faculty: The College has more than 29 experienced faculty members with more than 5 to 15 years of teaching the students. Most of the teachers have a post graduate degree in the field of nursing with some of them even having a doctorate in the field.